The composition of parliament’s ‘241’ security services committee has been determined today by a five-member select committee chosen at Monday’s sitting. Parliamentary rules dictate proportional representation in standing committees for political parties based on the number of MPs in each party. 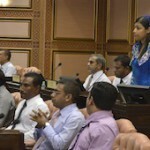 The select committee decided to allocate four seats for the ruling Progressive Party of Maldives (PPM), three seats for the opposition Maldivian Democratic Party (MDP), two seats for the Jumhooree Party (JP), and one seat each for the Maldives Development Alliance (MDA) and the Adhaalath Party (AP). Along with Independent MP Muaz Mohamed Rasheed, the committee will consist of 12 MPs. The select committee decided the number of seats to allocate for each party in the other 12 standing committees during meetings yesterday. The PPM with 38 MPs will have five seats each from 11 committees and four seats from one committee while the MDP with 25 MPs will have four seats from nine committees and one seat from three committees. The JP with 15 MPs will have two seats each from 11 committees and one seat from one committee. The MDA with its five MPs will have one seat from eight committees while Adhaalath Party MP Anara Naeem and Independent MP Muaz will each sit in two committees.